Meet ammonia, BOD, and/or nitrate limits: You need a solution that can consistently hit required Total Ammonia-Nitrogen, cBOD5 and Total Nitrogen/Nitrate removal levels. Increase the surface area available to attached-growth bacteria: By growing nitrifying and heterotrophic bacteria on a surface, BioPortz minimizes the washout associated with suspended-growth biomass. Keep footprint to a minimum: Real estate is at a premium, and a lack of aeration energy or oxygen isn't always the limiting factor. Nexom is the exclusive source for the BioPortz™ moving bed biofilm reactor (MBBR). BioPortz combines concentrated attached-growth reaction kinetics with Nexom's unmatched biological treatment expertise to create an industry leading nitrification, denitrification, and BOD removal technology. BioPortz MBBR media can be used in purpose-built tanks or to turn activated sludge basins into IFAS systems. BioPortz™ technology works very well as a stand-alone process or as part of a larger process, such as an integrated fixed-film activated sludge (IFAS) process. But in both cases, the fundamentals of how it works are similar. Flow enters the fully-aerated tank and encounters the biofilm-coated media. Coarse effluent screens prevent the patented BioPortz media from leaving the tank. Depending on the configuration, multiple tanks in series can be used to meet low effluent requirements and/or address several different contaminants and nutrients. Biomass is easiest to retain when it's fixed to a surface. Whether the intent is to remove BOD, nitrify ammonia, or even denitrify nitrates, growing biomass on a surface minimizes the washout that occurs in a suspended-growth environment. BioPortz provides that surface area—and plenty of it—in the form of dynamic media that is submerged and contained in a tank. While the biofilm is fixed on the media, the media itself circulates in the tank. The integrated aeration in the tank not only ensures high dissolved-oxygen levels throughout, it also moves the media within the tank, enabling a more even distribution of loading and oxygenation to the biomass. As a result, BioPortz™ MBBRs can accommodate rapid increases in loading or flows. Because there is ample surface area for biomass expansion and loading is effectively distributed across the media, BioPortz MBBRs are applicable not only to municipal nitrification, but can be used in other applications including roughing highly-variable BOD levels at industrial sites or for Combined Sewer Overflow (CSO) treatment. Even among MBBRs, BioPortz™ stands apart. Its patented media optimizes surface area for attached growth, ensuring that all 176 ft2/ft3 of media surface area are available to biomass. In addition, the carriers’ dimensions are engineered to carefully balance size and shape to enable both coarse media retention screening and effective media motion. Media isn't the only exclusive feature to BioPortz. Only Nexom offers Screen Scour™, which disperses media collecting on effluent screens, a particularly indispensable function in anoxic denitrification basins. How does the system need to be modified to remove nitrates? To enable the cultivation of the bacteria for denitrification (the conversion of nitrates to nitrogen gas), anoxic (oxygen-starved) conditions are required. 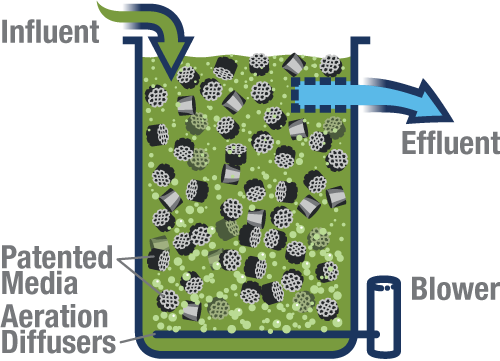 As such, the system eliminates any aeration and achieves dynamic motion of the media using mechanical mixing and Nexom's exclusive Screen Scour™ technology to prevent the flow through the system from collecting all the biofilm carriers around the effluent screens. The BioPortz™ process is the best choice for roughing high influent BOD, polishing ammonia, or upgrading to IFAS. In place at dozens of installations across North America, BioPortz MBBRs deliver as promised and ensure that operators sleep well at night knowing they have the system in place to beat their BOD and nutrient limits. Want to know what BioPortz could do for your system? Submit your RFP today and our in-house professional engineering team can help you size and design a BioPortz MBBR to meet your wastewater treatment requirements. How much does a BioPortz system cost? There are many factors which can influence the cost of a BioPortz system, including design flows, loading, treatment requirements, and existing infrastructure. The best way to determine the cost for your specific application is to submit your RFP to our project development team. How easily can a bioPortz system be upgraded? Based on its small footprint design and modular scalability, BioPortz is among the most simple wastewater treatment solutions to upgrade, whether your focus is further nitrification or BOD removal, denitrification to meet Total Nitrogen limits, or beyond. How often does BioPortz media need to be replaced? Almost never. The media is sized so that it can be retained by coarse effluent screens for no downstream media loss, and it is built from durable HDPE that means the BioPortz media that you start with should last the life of your installation. Does water need to be heated to achieve nitrification in a post-lagoon setting? If you are looking to achieve <1 mg/L of ammonia in freezing cold water, Nexom has already solved that problem with the SAGR, which has numerous proprietary advances that help it overcome limitations related to cold lagoon effluent. BioPortz is tremendously effective in many post-lagoon settings, so to identify which solution is best for you, reach out and let our Nexom engineers guide you.